"The Today Show" redirects here. For other programming called "Today", see Today (disambiguation). Today (stylized as TODAY), also called The Today Show, is an American news and talk morning television show that airs on NBC. The program debuted on January 14, 1952. It was the first of its genre on American television and in the world, and is the fifth-longest-running American television series. Originally a two-hour program on weekdays, it expanded to Sundays (a one-hour program) in 1987 and Saturdays (running for two hours) in 1992. The weekday broadcast expanded to three hours in 2000, and to four hours in 2007. Today's dominance was virtually unchallenged by the other networks until the late 1980s, when it was overtaken by ABC's Good Morning America. Today retook the Nielsen ratings lead the week of December 11, 1995, and held onto that position for 852 consecutive weeks until the week of April 9, 2012, when it was beaten by Good Morning America again. Today has maintained its No. 2 status since the summer of 2012 each year behind GMA. In 2002, Today was ranked No. 17 on TV Guide's 50 Greatest TV Shows of All Time. The show's first broadcast aired on January 14, 1952. It was the brainchild of Sylvester B. "Pat" Weaver, Jr., who was then vice president of NBC. Weaver was president of the company from 1953 to 1955, during which time Today's late-night companion The Tonight Show premiered. In pre-production, the show's proposed title was The Rise and Shine Revue. Today was the first program of its genre when it premiered with original host Dave Garroway. The program blended national news headlines, interviews with newsmakers, lifestyle features, other light news and gimmicks (including the presence of the chimpanzee J. Fred Muggs as the show's mascot during the early years), and local news updates from the network's stations. It has spawned several other shows of a similar type, including ABC's Good Morning America, and CBS' now-defunct The Early Show. In other countries, the format was copied – most notably in the United Kingdom with the BBC's Breakfast Time and TV-am's Good Morning Britain, and in Canada with Canada AM on CTV. When Today debuted, it was seen live only in the Eastern and Central time zones, broadcasting for three hours each morning but seen for only two hours in each time zone. Since 1958, Today has been tape-delayed for the five other U.S. time zones (Central, Mountain, Pacific, Alaska and Hawaii–Aleutian). Partly to accommodate host Dave Garroway's declining health, the program ceased live broadcasts in the summer of 1958, opting instead to broadcast an edition taped the previous afternoon. The experiment, which drew criticism from many sides, ended when John Chancellor replaced Garroway in July 1961. Generally, the program airs live in the Eastern Time Zone and on tape delay beginning at 7:00 a.m. in each of the five remaining time zones. When breaking news stories warrant, Today will broadcast a live West Coast edition. The live updates typically do not last longer than the 7:00 a.m. (Pacific Time) hour and once completed, will return to the taped East Coast feed. When the anchors welcome the viewers to the show, they will note the current time as being "Pacific Time" and continue to note it as such until the tape delay is started. In some instances, when an NBC News Special Report of breaking news occurs during the Today timeslot, the show's anchors will assume hosting responsibilities. During the first three hours of the program (or in some markets, the first 3½ hours, extending into the first half-hour of Today's fourth hour), local affiliates are offered a five-minute window at :25 and :55 minutes past the hour to insert a local newsbreak (which usually also includes a local forecast, and in large and mid-sized markets, a brief traffic report), although the show provides additional segments for those affiliates who do not provide such a news insert (certain NBC affiliates that produce an additional morning newscast for a sister station or digital subchannel may pre-tape the local inserts aired during the first one to two hours of Today to focus production responsibilities on their local broadcast). Starting in June 2014 SiriusXM Satellite Radio began simulcasting the Today Show on a new channel called 'Today Show Radio' Channel 108 with The Best of Today starting at 6am (Eastern) and the Today Show's live broadcast from Studio 1A at Rockefeller Center In New York City starting at 7am (Eastern) with a tape delayed broadcast at beginning 7am Pacific time. On Wednesdays and Fridays The Hoda Show with Hoda Kotb is broadcast exclusive on the Today Show radio channel. The channel also simulcasts NBC Nightly News with Lester Holt at 6:30pm (Eastern) and on the weekends starting at 7:30pm Eastern on Friday until 6:00am on Monday the channel is dark. Today Show Radio is also not currently available via the SiriusXM app or their website and is instead is replaced with a looped message however it should be noted that The Hoda Show is the only show on the channel that is available as an On-Demand pre-recorded stream using the SiriusXM app and on SiriusXM.com. The Today Show Radio service is also not currently available on SiriusXM's sister service in Canada and Channel 108 is locked out for Canadian subscribers. The Today program first originated from the RCA Exhibition Hall on 49th Street in Manhattan in a space now occupied by the Christie's auction house, just down the block from the present-day studio. 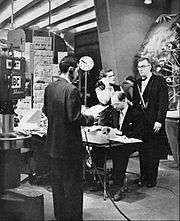 The first set placed a functional newsroom in the studio, which Garroway called "the nerve center of the world." The barrier between backstage and on-stage was virtually nonexistent. Garroway and the on-air staff often walked through the newsroom set. Glimpses of the camera crew and technicians were a frequent occurrence, as were off-screen voices conversing with Garroway. Gradually, machines and personnel were placed behind the scenes to assemble the news and weather reports, and the newsroom was gone by 1955. After three years in the Florida Showcase, Today moved back to the RCA Building on September 13, 1965. The network converted its news programming to all-color broadcasts at that time, and NBC could not justify allocating four (then-expensive) color cameras to the Florida Showcase studio. For the next 20 years, the show occupied a series of studios on the third, sixth, and eighth floors of NBC's headquarters; most notably Studio 3K in the 1970s, Studio 8G (adjacent to Studio 8H, home to Saturday Night Live) in the late 1970s and early 1980s, and finally Studio 3B from 1983 to 1994. Today moved to the new street-side studio on June 20, 1994, providing a link to the show's 1950s origins. Since the debut of the 1990s set, the national morning news programs of each of the major broadcast and cable-news networks have moved street-side – including two of Today's Rockefeller Center neighbors, Fox News Channel's Fox & Friends (at Avenue of the Americas) and CNN's since-cancelled American Morning (in the summer of 2005, CNN reversed the trend, abandoning its street-level studio and moving upstairs in the Time Warner Center at Columbus Circle). ABC's Good Morning America broadcasts from Times Square Studios, although only a portion of its studio is streetside (its main newsdesk is in an upstairs studio overlooking Times Square, while a secondary first-floor studio used to conduct interviews, indoor music performances and other non-general news segments is adjacent to the street). In 2006, Studio 1A underwent a major renovation to prepare for the upgrade to high-definition broadcasts. After the departure of Katie Couric and while a new set was readied (during the summer of 2006), the program was broadcast from a temporary outdoor studio in Rockefeller Plaza, the same set that NBC used at the Olympic Games since 2004. During the week of August 28, 2006, the show was moved to a temporary location outside of Studio 1A because MTV was converting the outdoor studio into their red carpet booth for the 2006 MTV Video Music Awards. A mock set was set up in Dateline's studio, which was also used during inclement weather. The program also used a temporary outdoor set at 30 Rock, and MSNBC's Countdown with Keith Olbermann (which joined at Studio 1A in 30 Rock on October 22, 2007). On September 16, 2013, Today debuted a new set and graphics package (it was originally set to debut on September 9, but was delayed one week to complete final design details). The "home base" is located on a platform that can spin 360°, therefore allowing the view and direction of the camera to change depending on the half-hour. A new couch and background was added in the "sofa area" (where the anchors sit and discuss topics). A social media area known as the "Orange Room", was also added to Studio 1A, which contains screens that display Twitter comments or trending topics; Carson Daly was hired to present segments from the room during the broadcast. Six screens that also connect to one 6' x 16' screen were added in the fashion/special topic area. During its first two days of use, the show transitioned away from its news and entertainment format to a format that emphasized the social interaction of the anchors, Roker and newsreader. The graphics were also overhauled with introduction of the new set (a slightly modified version of this package and the revised logo debuted on Early Today that November, further integrating the early-morning news program's branding with Today). The logo-to-peacock animation was moved from the left corner to the bottom right side corner of the screen. The logo that was first previewed on September 13, 2013, pared down the number of circular arches from five to three with its coloring switching from different variations – generally shades of red, orange and yellow to depict a sunrise – to entirely orange. The first two hours of the show are anchored by Matt Lauer and Savannah Guthrie. Al Roker serves as weather forecaster. And Carson Daly is the "Orange Room" anchor (social media reporter). Roker and Tamron Hall co-host the third hour (Today's Take), while Hoda Kotb and Kathie Lee Gifford co-host the fourth hour. Saturday editions are anchored by Sheinelle Jones, Craig Melvin and Stephanie Ruhle. Willie Geist anchors on Sunday. Meteorologist Dylan Dreyer provides the weather forecasts on weekends. Hall and Kotb occasionally substitute for Guthrie, while Geist and Daly frequently substitute for Lauer. Dreyer frequently fills in for Roker and Daly. Geist, Hall, Kotb and Jones will frequently fill in as "Orange Room" anchor. Jenna Bush Hager occasionally substitutes as "Orange Room" anchor and co-host of the third and fourth hours. Other NBC personalitites such as Kate Snow, Andrea Canning and Chris Jansing also substitute for the program. Regular correspondents include Miguel Almaguer, national correspondent Peter Alexander, Tom Costello, Joe Fryer, Senior Legal and Investigative correspondent Cynthia McFadden, Capitol Hill correspondent Kelly O'Donnell, National Investigative correspondent Jeff Rossen, Kerry Sanders, Maria Shriver, Keir Simmons, Kate Snow, Meet the Press moderator and NBC Political Director Chuck Todd, Katy Tur, chief justice correspondent Pete Williams and Special Correspondent and Contributor Meredith Vieira. Dr. Nancy Snyderman served as the network's chief medical editor until 2015. Jean Chatzky is Today Financial Editor and is editor-at-large for Money Magazine and provides financial segments. CNBC correspondents, Jim Cramer, Sharon Epperson and Eunice Yoon occasionally appear on the show, while MSNBC and The Weather Channel correspondents are frequent contributors. Jenna Bush Hager is a special correspondent for the program, and Joelle Garguilo is a correspondent for the weekend editions. Bob Dotson, Jamie Gangel, Len Berman and Jill Rappaport appear occasionally on the program. The Weekend Today anchors are also correspondents for the weekday edition. Walters was hired as a Today writer and researcher in 1961, making her first appearance that August with a segment on the Paris fashion show. She was appointed as a "Today Girl" and reporter in October 1964; a Today panelist in September 1966, and became the program's first female co-anchor upon Frank McGee's death in April 1974. Pauley was hired as a Today panelist in 1976, and was promoted to co-anchor when Bryant Gumbel joined the program in 1982. For the program's first 25 years, weather reports were delivered by the host or newsreader. Dave Garroway illustrated the day's forecast by drawing fronts and areas of precipitation on a big chalkboard map of the United States, based on information gathered earlier in the morning from the U.S. Weather Bureau in Washington, D.C. Subsequent hosts John Chancellor and Hugh Downs dropped the chalkboard weather map concept, and instead read a prepared weather summary over a still image of a weather map. When the show converted to all-color broadcasts in 1965, weather maps were prepared and projected on a screen behind Frank Blair, who delivered the forecast immediately after his news summaries. Following Blair's retirement on March 14, 1975, Lew Wood took over the newsreader and weather reporting duties. When Floyd Kalber was brought in as newsreader in 1976, Wood was relegated to weather, sports, roving reporter assignments, and presenting live on-air commercials until his departure in 1978. The weather is reported every half-hour during the program's first three hours, though since Al Roker took over as weather reporter, an interview is conducted by him in place of the national weather forecast at least once during the show, leaving only the local weather inserts by NBC stations. Today weather reporters have included Bob Ryan (1978–1980); Willard Scott (1980–1996); and Al Roker (1996–present). Until Ryan's hiring, no one on the show had practical experience or academic credentials in meteorology. Since NBC's purchase of The Weather Channel in 2008, personnel from that network frequently participate in Today forecast segments, at the site of a weather event or from the cable channel's suburban Atlanta headquarters, or as a fill-in for Roker. NBC owned-and-operated stations and affiliates are given a 30-second window to insert a local forecast segment into the program following the national weather report; Roker's outcue for the local break is "That's what's going on around the country, here's what's happening in your neck of the woods." Those not watching on an affiliate which provides local weather segments following the outcue (including international viewers, as well as NBC stations that do not have a news department) see a national summary of temperatures from Roker. The semi-retired Scott, who gained fame through his antics that included costumes and props, still appeared on-air to continue his tradition of wishing "happy birthday" to centenarians. Scott's traditional local cue is "Here's what's happening in your world, even as we speak." He retired from television on December 15, 2015. From 1953 to 1957, the program featured J. Fred Muggs, a chimpanzee whose antics entertained viewers, but frustrated the program's staff, especially Dave Garroway. Also occasionally appearing was J. Fred's "girlfriend" Phoebe B. Beebe. In 1989, Bryant Gumbel wrote a memo to the program's then-executive producer Marty Ryan, which was critical of other Today personalities, and was leaked to the press. In the memo, Gumbel commented that Willard Scott "holds the show hostage to his assortment of whims, wishes, birthdays and bad taste...This guy is killing us and no one's even trying to rein him in." He commented that Gene Shalit's movie reviews "are often late and his interviews aren't very good." There was enough negative backlash in regard to Gumbel's comments toward Scott that Gumbel was shown reconciling with Scott on Today. In 1989, Deborah Norville (then anchor of the network's early-morning news program at the time, NBC News at Sunrise) replaced John Palmer at the Today newsdesk, at which point he assumed her previous role on Sunrise. She also began substituting for Tom Brokaw on NBC Nightly News. Shortly after Norville's appointment as Today's news anchor, the decision was made to feature her as an unofficial third host. Whereas Palmer had read the news from a desk separate from where Gumbel and Pauley sat, Norville was seated alongside the program's hosts at the opening and closing of every show. Before long, gossip columns and media observers predicted that NBC would remove Jane Pauley from the program and replace her with Norville in an effort to improve the program's recently declining viewership among young women, the demographic most coveted by morning shows. During this period, Saturday Night Live featured a sketch titled "All About Deborah Norville" (a takeoff on the classic film All About Eve), which depicted Norville as ruthlessly scheming to take Pauley's place as Today co-host. In October 1989, it was announced that 13-year veteran Pauley would leave Today at the end of the year. NBC, as expected, announced that Norville would become co-host. An emotional Norville hugged Pauley on the air after the announcement was made, and many at the network hoped the negative press generated by Norville's increased presence on the program would end. However, this turned out not to be the case. Prior to the announcement of Pauley's departure, much of the criticism had focused on Norville's youth and beauty, with many branding her "the other woman" and a "home wrecker," in a reference to what some felt seemed like her intent on "breaking up" the television marriage of Gumbel and Pauley. The negative press only heightened after the announcement of Pauley's resignation, and Norville was put under a gag order by NBC brass, which prevented her from defending herself from the widespread and erroneous reports that she somehow orchestrated her rise on Today. In January 1990, the new anchor team of Bryant Gumbel and Deborah Norville, minus Jane Pauley, debuted with disastrous results. Ratings for the program began to plummet. Critics felt that Gumbel and Norville lacked chemistry and many loyal viewers began turning to rival ABC's Good Morning America (GMA). By the end of 1990, Today, the longtime dominant program, was officially the second-place morning show behind GMA, and most of the blame was pinned on Norville. By the outbreak of the Persian Gulf War in 1991, Norville saw her role as co-host continually minimized. Today aired special editions of the program called "America at War," with Gumbel anchoring most of the show alone. It was not uncommon for Norville not even to appear until the two-hour show's second half-hour. In addition, she was directed not to initiate conversation on the show and only speak when asked a question by Gumbel. Norville left the show for maternity leave in February 1991. It was announced that Katie Couric would substitute co-host during Norville's absence. Ratings for the program rose immediately following Norville's departure and Couric's arrival. Midway though her maternity leave, Norville was interviewed by People. In the story, she avoided conversation about her recent trouble on Today, and instead focused on her newborn baby boy. She was photographed breastfeeding her son, a seemingly innocuous event, but NBC management was said to be greatly displeased by this, believing the photo to be "in poor taste". By April 1991, in light of improved ratings on Today and NBC's displeasure at the People photograph, it was announced that Norville would not return to Today and that Katie Couric had been named the program's co-host. Norville, it was disclosed, would continue to be paid in accordance with her contract, although she would no longer appear on any NBC News programs. On April 5, 2006, Katie Couric announced on her 15th anniversary as co-host of Today that she would leave the program and NBC News at the end of May to become the new anchor and managing editor of the CBS Evening News. Couric's final broadcast on May 31, 2006 was dedicated to her 15 years as one of the show's co-hosts, and celebrated her move to the anchor chair at CBS, where she also became a correspondent for the network's Sunday night newsmagazine program 60 Minutes. Couric said during the show, "It's been a pleasure hosting this program, and thank you for fifteen great years." A special video presentation was broadcast, recapping her best moments and news stories on Today during her 15 years with the show. The day after Couric's announcement, Meredith Vieira, then a host of ABC's The View announced on that show that she would take over as Lauer's co-anchor in September. Lauer and Vieira began co-hosting together on September 13, 2006. On June 1, 2006 (the day after Couric's departure), NBC News announced that for the summer of 2006, Today would move to a temporary outdoor studio as Studio 1A was going through renovations to prepare for its switch to high-definition. On that same day, NBC News launched a new advertisement promoting Vieira's arrival. That summer, Couric's anchor seat was filled by various hosts, consisting of Curry, Morales and Campbell Brown (all of whom were considered candidates to replace Couric), until Vieira took over that fall. After announcing her resignation, Meredith Vieira departed the program on June 8, 2011. Vieira's spot was filled by the program's longtime news anchor Ann Curry, appearing alongside Matt Lauer as co-host. Correspondent Natalie Morales replaced Curry as news anchor in turn, with Al Roker remaining as the weather anchor. Savannah Guthrie joined Morales and Roker as co-host of the third (9:00 a.m.) hour. Almost a year after her departure, Vieira returned briefly to Today as a special correspondent for events relating to Queen Elizabeth II's Diamond Jubilee Celebration. On June 5, 2012, she co-presented the show with Lauer from London. After the shooting of Florida teenager Trayvon Martin, Today ran a selectively edited version of the 9-1-1 call that George Zimmerman made prior to shooting and killing Martin (which he defended as being committed in self defense while standing trial for the shooting, for which he was acquitted on charges of murder in August 2013), which had the effect of making Zimmerman appear racist. In a February 2012 edition of the program, Today played a recording of Zimmerman saying, "This guy looks like he's up to no good. He looks black." However, several seconds of the call were cut from the 911 tape, removing Zimmerman's description of Martin, and a question asked to him about the teenager by the 911 operator. In the original, unedited tape, Zimmerman said, "This guy looks like he's up to no good. Or he's on drugs or something. It's raining and he's just walking around, looking about." The operator then asked, "OK, and this guy – is he black, white or Hispanic?," to which Zimmerman answered, "He looks black." The Washington Post wrote that Today's alteration "would more readily paint Zimmerman as a racial profiler. In reality's version, Zimmerman simply answered a question about the race of the person whom he was reporting to the police. Nothing prejudicial at all in responding to such an inquiry... it's a falsehood with repercussions. Much of the public discussion over the past week has settled on how conflicting facts and interpretations call into question whether Zimmerman acted justifiably or criminally... To portray that exchange in a way that wrongs Zimmerman is high editorial malpractice..."
Following an internal investigation into the production of the segment, NBC News fired two employees that were involved in the piece, including a producer based at the division's Miami bureau, in April 2012. In December 2012, George Zimmerman filed a defamation lawsuit against NBC for the editing of the 911 call. Florida Circuit Court Judge Debra Nelson dismissed the suit on June 30, 2014, citing that there were "no genuine issues of material fact upon which a reasonable jury could find that the Defendants [NBCUniversal] acted with actual malice," but although Zimmerman could not prove that he was the victim of "actual malice", stated that the malice standard was appropriate since Zimmerman is a public figure. NBC revealed on June 28, 2012, that Ann Curry would no longer co-host Today, and would continue to work for NBC News (where she remained until her departure in January 2015), including continuing to appear on Today. Curry's title was changed to "Today Anchor at Large and NBC News National & International Correspondent," with responsibilities including leading a seven-person unit producing content for NBC Nightly News, Dateline NBC, Rock Center with Brian Williams and Today, with occasional anchor duties for Nightly News. Curry also reported for NBC's coverage of the 2012 Summer Olympics in London. On July 9, 2012, Savannah Guthrie succeeded Curry as co-anchor alongside Lauer, Roker and Morales. Ann Curry's final show as co-anchor was subdued compared to the earlier departures of Katie Couric and Meredith Vieira, as it did not include retrospectives of Curry's 15-year run on the program or goodbye messages from colleagues and celebrities, although Curry – seated alongside Lauer, Natalie Morales and Al Roker in the couch area of the Studio 1A set – gave a tear-filled farewell message to viewers. Rumors of Curry's departure from Today began weeks before NBC formally announced that she would no longer be co-host, spurring negative press similar to that resulting from the departure of Jane Pauley and her replacement by Deborah Norville 23 years earlier, as since disproven reports suggested that Matt Lauer had a hand in the program's decision to let Curry go. Viewership declines for the program that began in the months following Curry becoming co-host precipitated in part due to public criticism over Lauer's alleged involvement in Curry's departure; loyal viewers once again began turning to the competing Good Morning America, which toppled Today's 16-year consecutive run as the top-rated morning news program during the week of April 9, 2012. The public relations problems for Lauer that resulted from the accusations, led then-executive producer Jim Bell to admit responsibility for the negative press, in defense of Lauer, in a series of interviews with The New York Times, The Hollywood Reporter and the Associated Press. On September 11, 2012, Today sparked outrage after the program neglected to cut away from an interview with Keeping Up with the Kardashians co-star Kris Jenner to broadcast the 11th anniversary remembrance ceremonies of the September 11, 2001 terrorist attacks at 8:46 a.m. Eastern Time, when a moment of silence in memory of the 2,977 American people who died in the tragedy was being conducted in accordance with the time that American Airlines Flight 11 crashed into the North Tower of the World Trade Center. NBC was the only national television news outlet in the United States that did not interrupt regular programming to broadcast the moment of silence live. While the coverage of the ceremonies was not seen on the NBC network feed in most of the country, the network's New York City flagship owned-and-operated station WNBC interrupted the Today broadcast to run locally produced special coverage of the entire ceremony. In 1999, NBC canceled Sunrise and replaced it with a new program titled Early Today, which was originally produced by CNBC, and focused on business and financial news before switching to a general news format under the same production staff as MSNBC's First Look in 2004. Early Today continues to air on the network, airing live each weekday morning at 4:00 a.m. Eastern Time (with an updated telecast for viewers in the Pacific Time Zone), and on tape delay until 10:00 a.m. Eastern – corresponding with the start time of Today in the Pacific Time Zone – to allow for adjustment in airtimes for other time zones and for certain NBC stations without a local morning newscast to air Early Today in lieu of one. The weekend broadcasts continue the Today format of covering breaking news, interviews with newsmakers, reports on a variety of popular-culture and human-interest stories, covering health and finance issues; and national weather reports. NBC feeds the Saturday edition from 7:00 to 9:00 a.m. and the Sunday edition from 8:00 to 9:00 a.m. (both in the Eastern Time Zone), although many of the network's affiliates air local newscasts in those time slots and carry the network broadcast earlier or later in the morning; many NBC affiliates also bookend the Sunday edition with local morning newscasts that immediately precede and follow the program. NBC's New York City, Chicago, San Francisco and Los Angeles owned-and-operated stations air Weekend Today simultaneously (but not live) at 9:00 a.m Eastern, 8:00 a.m. Central and 6:00 a.m. Pacific Time. During the network's coverage of the Olympic Games, the weekday anchors and staff present the majority of the program on both Saturday and Sunday throughout the two weeks to maintain promotional momentum, with limited contributions from the weekend team from New York. In 1999, NBC canceled Sunrise and created two brand extensions for Today. One was Early Today (not to be confused with the earlier incarnation); the program originally was produced by CNBC and focused on business and financial news before switching to general news under the same production staff as MSNBC First Look; it continues to air on many NBC affiliates. Also in the fall of 1999, Later Today, a talk show that was intended to air immediately following the then two-hour Today, was launched with hosts Jodi Applegate, Florence Henderson and Asha Blake. Sagging ratings for that show caused its cancellation in August 2000; it was replaced two months later by the current third hour of Today. Today's Take (sometimes called The Take) is the third-hour segment of Today. This "show-within-a-show" has its own anchors (although featuring on-air staff that appears during the first two hours of the program), opening title sequence and theme music. The hour is hosted by Dylan Dreyer, Al Roker and Tamron Hall. On May 17, 2000, NBC expanded Today to three hours, with the addition of an hour from 9:00 to 10:00 a.m. For its first twelve years, the format of the third hour was originally structured similarly to Today's first two hours, using the same anchors as that portion of the broadcast; separate anchors began to be used for the third hour over time, with only the news anchor (Ann Curry until 2011, then Natalie Morales) and the weather anchor (Al Roker) being shared with the main 7:00 to 9:00 a.m. block – this was particularly the case during instances where Matt Lauer and/or his co-host (Katie Couric, then Meredith Vieira from 2006 to 2011, Ann Curry from 2011 to 2012 and finally Savannah Guthrie during the final months of the original format) could not be present for the entire hour due to reporting assignments or personal commitments. Viera, outside of breaking news situations, was specifically disallowed by contract from any duties in the third hour due to her hosting commitments to the syndicated version of Who Wants to Be a Millionaire? by Buena Vista/Disney–ABC Domestic Television. The format of the third hour was revamped on November 12, 2012, at which time it was given its own in-program title Today's Take. Roker was joined during the revamped third hour by Natalie Morales and Willie Geist (who had recently joined Today after ending his run as the original anchor of MSNBC's Way Too Early); MSNBC anchor and Today correspondent Tamron Hall was added as a co-host for that hour of the program on February 24, 2014, and Ellie Kemper joined the program on June 29, 2015 as a temporary co-host (until July 17, 2015). With the change, traditional news segments at the beginning of the hour were abandoned in favor of a topical "host chat" format similar to the opening segment of the succeeding fourth hour of the program (with the only difference being that top general news events are discussed somewhat more often, in addition to featuring topical discussions on offbeat and pop culture-related stories and periodic clips from television programs aired the previous night and videos trending online). Instead, the news segment (titled News with Natalie, anchored by Morales, and alternately titled Today's News on days when Morales is off) is featured prior to the local update cutaways near the end of the first half-hour; national weather segments are also retained following the host chat segments in both half-hours. Beginning in May 2015, the News with Natalie/Today's News segment was moved to 9:30 am and the national weather segment to follow and the host chat at 9:30 was discontinued. On August 22, 2016, both Morales and Geist left Today's Take and former Access Hollywood host Billy Bush officially joined the set. He was later suspended and eventually fired from the segment as well as the program following the controversy that arose during U.S Republican and presidential candidate Donald Trump's campaign in October 2016. The fourth hour debuted on September 10, 2007, originally hosted by Ann Curry, Natalie Morales, and Hoda Kotb. Kathie Lee Gifford replaced Curry and Morales as co-host on April 7, 2008. The fourth hour does not have news or weather segments (other than local newsbreaks aired during the first half-hour on some NBC stations, provided they air the fourth hour at 10:00 a.m.) or input from the earlier hosts and is structured virtually as a standalone talk show, with an opening "host chat" segment reminiscent of the one popularized by Gifford and Regis Philbin on Live! with Regis and Kathie Lee, as well as interviews and features focusing on entertainment, fashion and other topics aimed at female viewers. The fourth hour of Today competes with ABC's The View and CBS's The Price Is Right in most markets in the Central and Pacific Time Zones, but most stations in the Eastern Time Zone air it live one hour before those programs, as ABC and CBS's late morning daytime programs are not tape delayed for each time zone. Not all NBC affiliates carry the fourth hour live, the program airs on a tape delay in some markets that may place it in late morning or early afternoon timeslots at the station's discretion to make room for local lifestyle or syndicated programming. On September 26, 2011, the fourth hour of Today began to be rebroadcast as part of NBC's overnight lineup (formerly known as NBC All Night) on weekday early mornings at 2:05 a.m. Eastern and Pacific Time (varied according to local scheduling; although the rebroadcast is pre-empted by NBC affiliates in a few markets, such as those owned by Graham Media Group), as a replacement for Poker After Dark, which was cancelled due to legal issues involving that show's sponsor Full Tilt Poker and televised poker in general. Today host Dave Garroway selected Les Brown's "Sentimental Journey" as the program's original theme music, which was used during Garroway's entire run from 1952 to 1961. In 1962, when Hugh Downs became host, Django Reinhardt's "Melodie au Crepuscule" was chosen as the new theme; it was replaced in 1963 by "Misty", an instrumental ballad composed by Erroll Garner and performed by Bobby Hackett and John B. Seng. "Misty" served as Today's theme until 1971, when NBC News correspondent Frank McGee joined the show. Composer Ray Ellis penned an entirely new instrumental theme entitled "This is Today", a jazzy, up-tempo piece that served as the program's main theme until 1978. Because This is Today closely resembled the theme "Day by Day" from the musical Godspell, Ellis was sued for copyright infringement, a lawsuit that was ruled in favor of that song's composers. "This is Today" was revised as a result, with the second version of the piece incorporating the familiar NBC chime signature (G-E-C) in a bright, appropriately sunny arrangement that was used until 1981, at the close of the Tom Brokaw–Jane Pauley era. The G-E-C signature was also used throughout the program to introduce and conclude segments, usually in combination with the familiar Today sunburst logo. By the time Bryant Gumbel was appointed co-anchor of the program in 1982, a new version of Ellis' "This is Today" theme was introduced, using a looser, more relaxed arrangement that continued to feature the NBC chimes in its melody. A shorter arrangement of "This is Today" was used for the show open (featuring a rotating globe and the Today sunburst) from 1983 to 1985. The main theme was used until 1985, and due to its popularity with viewers was resurrected as the show's secondary theme in January 1993. The 1982 theme later served as the program's official "anniversary" music, used to open and close retrospective segments in the leadup to Today's 60th anniversary in 2012. 1985 saw the end of the synthesizer era at NBC as composer John Williams wrote a series of themes for all NBC News programs, with a cut entitled "The Mission", serving as the principal theme for NBC Nightly News with Tom Brokaw. Williams also composed two themes for Today: an opening fanfare for the program that was derived from the opening of "The Mission"; and a two-minute closing theme for the show entitled "Scherzo for Today", a dramatic arrangement that made heavy use of strings and flutes. In the late 1980s, "Scherzo" was played in its entirety multiple times daily during the weather scrolls that ran during local commercial breaks; however, most NBC affiliates preempted these segments with locally slotted advertising. The new Today themes – used in tandem with the show's new opening sequence featuring the Statue of Liberty and a new living room studio set – gave the program a distinctly modern look and sound beginning in September 1985. A series of Williams-penned bumpers featuring the "Mission" signature were also used to open and close segments. "Scherzo for Today" was used as the program's closing theme until 1990, and the "Mission" bumpers were used until 1993 (one of them could be heard as a station break lead-in on NBC's Meet The Press until 2004). Meanwhile, Williams' opening fanfare had opened the program ever since its 1985 introduction, with two brief interruptions; new opening themes were briefly introduced and quickly discarded in the summer of 1994 (to mark the debut of Studio 1A) and in 2004. The fanfare was iconically accompanied by Fred Facey announcing "From NBC News, this is Today... with (anchor) and (anchor)" (with "Live from Studio 1A in Rockefeller Plaza" being added to the introduction on June 20, 1994, when the show moved to its new studio). Although Facey died in April 2003, his introduction of the Couric–Lauer team was used for the duration of Couric's era (except for special editions requiring special introductions). Weekend Today announcer Les Marshak became the new voice of the weekday program on September 13, 2006. A lighter theme employing the NBC chimes was used to open the show's 7:30 through 9:30 a.m. half-hour segments, and was also used as a closing theme. In March 2013, "The Mission" was replaced with a theme composed by Adam Gubman for Non-Stop Music. Along with Non-Stop Music, Gubman's rebranding could be heard dating back to Today's coverage of the wedding of Prince William and Catherine Middleton in April 2011. Gubman went on to write music for the network's 2012 election coverage, and continues to provide audio content for Today. From 1995 to 2012, Today generally beat ABC rival Good Morning America in the ratings among all network morning programs. By the week of September 11, 2006, the program earned 6.320 million total viewers, 1.6 million more than the 4.73 million viewers earned by Good Morning America. This gap eventually decreased, as by the week of June 30, 2008, Today was watched by an average of 4.9 million viewers, compared to Good Morning America's 3.8 million. Furthermore, by the week of October 12, 2008, Today's total viewership had gone up to 4.910 million viewers, compared to second place Good Morning America's total viewership of 4.25 million (and significantly above the 2.66 million viewers earned by CBS' The Early Show). For the week above, the third hour (referred as "Today II" by NBC exclusively for Nielsen ratings counts) drew 2.9 million viewers and the fourth hour (referred in Nielsen ratings as "Today III"), delivered 1.7 million. For the week of January 4, 2009, the 8:00 a.m. hour of Today averaged 5.998 million viewers; the 9:00 a.m. hour, meanwhile, averaged 4.447 million total viewers and a 1.4 rating among adults aged 25–54, marking that hour's best ratings since the week of August 11, 2008. The 10:00 a.m. hour averaged 2.412 million total viewers and a .8 rating in the demographic, the highest total viewership for that portion of the program since the week of December 31, 2007. For the week of April 11, 2011, the program passed its 800th consecutive week as the No. 1 rated network morning news program, with 5.662 million total viewers (ahead of Good Morning America by approximately 1.2 million viewers). During the week of April 25, 2011, Today averaged 6.424 million viewers, marking its best weekly total viewership since August 11, 2008, during the Beijing Olympics. This was largely buoyed by the April 29 coverage of the wedding of Prince William and Catherine Middleton, which earned 9.628 million viewers (beating Good Morning America's coverage by more than 1.6 million viewers), and was also the best single day rating since November 8, 2000, the day after the 2000 presidential election. NBC News programs, including the live broadcast of Today, are shown daily on the 24-hour news network OSN News in MENA Region. In Australia, NBC Today (the title used in that country to avoid confusion with the local Nine Network program Today) airs an edited 42-minute version of the first two hours from 4:00 a.m. Tuesday to Saturday on the Seven Network (rerun at 9:00 a.m. on sister network 7Two). The Today's Take hour (which is abbreviated to the same runtime) only airs Saturdays on the primary channel and Tuesday to Saturday on 7Two; while Seven broadcasts the Sunday edition at 5:00 a.m. on Mondays, following Meet The Press. The program was originally trimmed to 63 minutes, with the local news cutaways removed. However, a news ticker appears at the bottom of the screen, containing national headlines, as well as information on the next edition of Seven's morning program Sunrise. A national weather map of Australia is inserted during local affiliate cutaways during the weather segment. Today does not air on the primary regional affiliates Prime7 and GWN7, which instead air paid programming. In the Philippines, Today was aired on 9TV (formerly called as Talk TV and Solar News Channel) from 2011 to August 2014; an edited 90-minute version of the weekday editions aired Tuesdays through Saturdays at 5:30 a.m., with a two-hour abbreviated broadcast of the Friday editions airing at 10:00 a.m. local time on Saturdays. Weekend Today airs Saturdays for two hours at 10:00 p.m. and Sundays at 11:00 p.m. local time. The local affiliate cutaways during the weather segment were removed only from the weekday editions. Today with Kathie Lee and Hoda (titled Today's Talk for the TalkTV/SNC/9TV broadcasts) aired Tuesdays to Saturdays at 3:00 a.m. Both shows were removed from the schedule since then, particularly with the relaunch of 9TV as CNN Philippines. 1 2 3 "'GMA' Weeklong Win Over 'Today' Confirmed; First Win in 16 Years". mlb.com. Chicago Tribune. Retrieved April 19, 2012. ↑ "TV Guide Names Top 50 Shows". CBS News. Retrieved 2011-11-09. ↑ Ed Weiner; Editors of TV Guide (1992). The TV Guide TV Book: 40 Years of the All-Time Greatest Television Facts, Fads, Hits, and History. New York City: Harper Collins. p. 173. ISBN 0-06-096914-8. ↑ Richard F. Shepard (June 30, 1961). "Stevenson Plans ABC Series". The New York Times. p. 55. ↑ The weekday & Saturday editions air live exclusively in the Eastern Time Zone, even when it goes on the road. ↑ Glen Dickson (August 21, 2006). "A New Dawn for 'Today'". Broadcasting & Cable. ↑ "'Today' Show's New Set Delayed a Week". TVNewser. Mediabistro.com. September 9, 2013. ↑ "'Today' show introduces new set, Orange Room to much fanfare". New York Daily News. September 16, 2013. ↑ "'Today' show gets makeover with new set, Carson Daly". Reuters. September 12, 2013. ↑ National Broadcasting Company, "Today" promotional material, 1951. ↑ "Lew Wood, TV Newsman, Dies at 84". The New York Times. Associated Press. August 22, 2013. Retrieved September 13, 2013. ↑ National Broadcasting Company (1967). Today: The First Fifteen Years. ↑ N.R. Kleinfield (April 5, 1987). "Star Weatherman: Willard Scott A Huckster For All Seasons". The New York Times. ↑ Barbara Walters (2008). Audition: A Memoir. New York: Alfred A. Knopf. pp. 107–114. ISBN 978-0-307-26646-0. ↑ Monica Collins (March 1, 1989). "Memo to NBC: We Love Scott". USA Today. ↑ Brian Donlon (March 14, 1989). "On Today, it's kiss and make up". USA Today. ↑ "Newcomer Deborah Norville Stirs the Latest Tempest in the Today Show's Coffee Cup". People. October 9, 1989. ↑ "Tale Of 2 Women: The Tempest At 'Today'". Chicago Tribune. October 13, 1989. ↑ "TV News, Women and Deborah Norville : Her ascension on the 'Today' show revives the Beauty Factor issue in broadcast news". Los Angeles Times. November 26, 1989. ↑ "The Woman Who Replaced Jane Pauley's Replacement". The New York Times. April 8, 1991. ↑ "Meredith Vieira Named Special Correspondent on Brian Williams Newsmagazine". The Hollywood Reporter. September 13, 2011. ↑ "NBC to do 'internal investigation' on Zimmerman segment". The Washington Post. March 31, 2012. ↑ Brian Stelter (April 6, 2012). "NBC Fires Producer of Misleading Zimmerman Tape". The New York Times. Retrieved February 8, 2015. ↑ Rene Stutzman (June 30, 2014). "Judge throws out George Zimmerman's libel suit against NBC". Orlando Sentinel. Retrieved February 8, 2015. ↑ "Savannah Guthrie named co-anchor of TODAY". Retrieved June 29, 2012. ↑ "Ann Curry Bids a Tearful Farewell to 'Today'". PRNewser. Mediabistro.com. June 28, 2012. ↑ "Farewell, Without a Parachute". The New York Times. June 28, 2012. ↑ "'Today' Mishandles Ann Curry's Departure". PRNewser. Mediabistro.com. June 29, 2012. ↑ "'Operation Bambi': How and Why NBC Kicked Ann Curry Off Today". New York Magazine. April 18, 2013. ↑ "Waking Up on the Wrong Side of a Ratings War". The New York Times. April 18, 2013. ↑ "'Today' Chief: Transition Was 'Tough,' but It's Not Matt Lauer's Fault". The Hollywood Reporter. September 26, 2012. ↑ "'Today' Producer Says Ouster of Ann Curry Was His Choice". The New York Times. September 26, 2012. ↑ "'Today' producer angry about Lauer stories". Huffington Post. Associated Press. September 26, 2012. ↑ "Today show skips moment of silence, talks about breast implants with Kris Jenner". Fox News. September 11, 2012. Retrieved September 11, 2012. ↑ "NBC's 'Today' Skips 9/11 Moment Of Silence For Kardashian Interview". TVNewser. Mediabistro.com. September 11, 2012. ↑ "NBC Apologizes to Affiliates for No 9/11 Moment of Silence on 'Today' (Report)". The Hollywood Reporter. September 12, 2012. ↑ "'Today' Announces Ellie Kemper as New Co-Host". Yahoo!. 25 June 2015. Retrieved 5 July 2015. ↑ Dana Hunsinger Benbow (September 6, 2013). "Today show secrets: Kathie Lee hums to herself, Hoda devours M&Ms". The Indianapolis Star. Retrieved December 12, 2014. ↑ Jacques Steinberg (January 17, 2007). "NBC's Today Is Expected To Add a Fourth Hour". The New York Times. Retrieved September 7, 2008. 1 2 "The Today Show / NBC Today Show". Classicthemes.com. Retrieved November 9, 2011. ↑ Brian (September 13, 2006). "Meredith Debuts: The New Voice Of 'Today'". TVNewser. Mediabistro.com. Retrieved November 9, 2011. ↑ Chris Ariens. "Morning Show Ratings". TVNewser. Mediabistro.com. Retrieved November 9, 2011. ↑ "Today Beats GMA for the Week Ending October 12 – Ratings". TV by the Numbers. October 17, 2008. Retrieved November 9, 2011. ↑ Merrill Knox. "TVNewser – And Now the News...About TV News". TVNewser. Mediabistro.com. Retrieved November 9, 2011. ↑ "TODAY Show Hits 800 Weeks At Number One". Mediaite. April 21, 2011. Retrieved November 9, 2011. ↑ jeffary (May 5, 2011). ""Today's" Royal Ratings". TV by the Numbers. Zap2It/Tribune Media. Retrieved November 9, 2011. 1.^ Walters was women's editor and contributor from 1961 through 1964. In 1964, her role was titled "Today Girl" and panelist. In 1966, she began regularly co-anchoring alongside Downs. In 1974, following the death of McGee, she was titled "co-host". Wikimedia Commons has media related to Today (U.S. TV program).